Home About the Company Press and Media News Africa Eco Race 2017 – started! Africa Eco Race 2017 – started! The ninth year of the Euro-African competition in the footsteps and style of the founder of the famous Dakar, Thierry Sabine, has "launched" racers into real timed stages. The traditional TATRA trump card in the African-fire is Ing. Tomas Tomeček, a triple winner of AER. This year, however, there's another racing TATRA truck appearing on the competition tracks. Since his return to Northwest Africa, Ing. Tomas Tomeček has achieved three victories, two second places and one third place in the Africa Eco Race (AER) competition. This is a rare even balance, which is attributable, in addition to the rider, to the crew and team, and also to the reliable machine, the racing T815. An undoubted attraction is the fact that the TATRA enlisted by Tomeček consistently uses the entire drive train based on long-tested and high-quality TATRA components. The racing T815 model with starting number 401 of the Promet Team/Czechoslovak Group with the crew of Ing. Tomas Tomeček and Ladislav Lala thus represents the original design of TATRA vehicles, including a direct air-cooled engine and proprietary gearbox. Heavy-duty trucks of the T815 commercial range currently known as TATRA TERRN01 have for decades been the main production flow of our automobile maker. During these years, the T815 became by far the most successful truck model, even among vehicles without category distinction, produced under the TATRA brand. The viability and competitiveness of the original TATRA TERRN01 design and concept is illustrated by the fact that the trucks of this commercial range are still part of our comprehensive offer. Selected models like R55 fire and the rescue special utilize the latest TATRA technologies and design solutions, such as the disc brake system. In 2017, as part of the 120th anniversary celebrations of the production of the first Koprivnice car equipped with an internal combustion engine, the TERRN01 model range will undergo major upgrading and introduce its successors - trucks designated as TATRA TERRA. 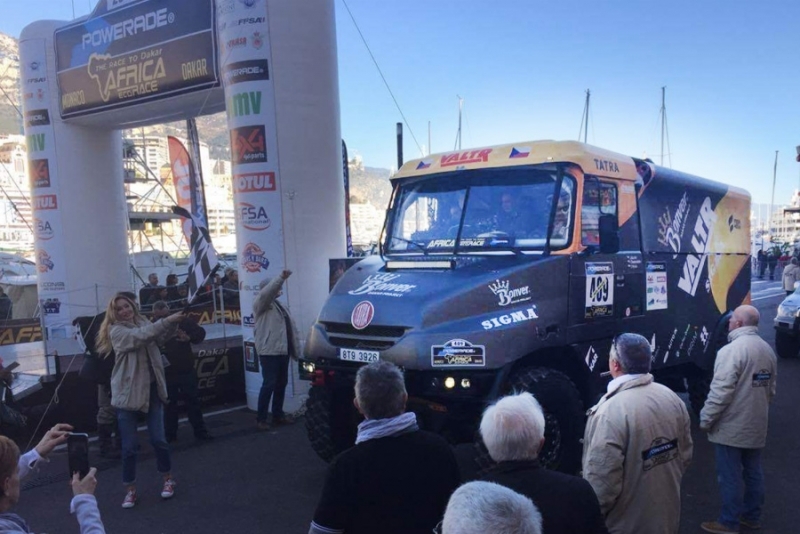 Having already set off for the AER 2017 track, the second racing TATRA truck is the TATRA JAMAL BDP of Jaroslav Valtr's crew, who brought us so much joy last year with the TATRA PHOENIX G2 at the 2016 Dakar Rally. It has embarked for the traps of the African terrain for the first time as part of the Bonver Dakar Project team. 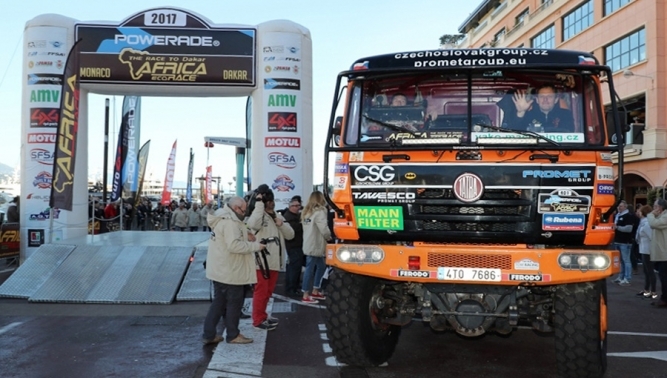 Navigator Rostislav Plny and board engineer Filip Skrobanek are assisting forty-seven-year-old Jaroslav Valtr in the cab of the bonneted special racing truck. Six and a half thousand kilometres through African countries in the spirit of the Dakar adventure founder Thierry Sabine. Start in Monaco, five stages in Morocco, six stages in Mauritania and one, final stage in Senegal. Finish line at Pink Lake. An African adventure worthy of traditionalists who care about business originality. We also remind all fans of the Dakar Rally that the official T-Shop (http://tatra.aba-reklama.cz) is coming out with a second, updated edition of "TATRA in the leading role", showcasing the 30-year history of its racing trucks and accompanying vehicles in one of the toughest rallies in the world.